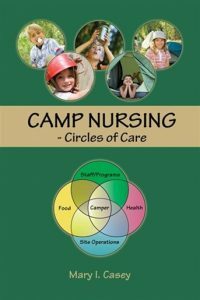 Camp Nursing – Circles of Care is an acclaimed book written by Mary Casey (BScN PHN). Mary is an experienced camp nurse and award-winning author. This handy, comprehensive, reference book includes an extensive chapter, Treatment Guidelines, which includes accepted procedures on illness and accidents. Camp Nursing-Circles of Care is an overview of the multi-facetted job of the nurse at camp, and presents principles that are applicable to all health professionals and to camps with varying combinations of health care staff. Order your camp’s copy from www.volumesdirect.com or contact Mary Casey at CampNursingbyMCasey@gmail.com.